One hundred and ninety-four countries submitted Nationally Determined Contributions (NDCs) as part of the international Paris Agreement on climate change. We analyzed these plans and visualized them alongside countries’ historical emissions on the Climate Watch open data platform, where you can also compare countries’ NDCs in detail. We found that NDCs from 67 countries—collectively responsible for 44 percent of the world’s emissions, including the three highest emitters—lack the full information needed for calculating how their plans will affect their country’s future emissions. This lack of transparency makes it harder to track national progress, hold leaders accountable, or assess what level of warming the world is on track to endure. Fixed-level targets (and in very few cases, trajectory targets) can be the easiest to quantify, as they specify the absolute emissions level in a target year or trajectory (for example, targets in 2025 and 2030). For example, Argentina specified that it will not exceed net emissions of 483 million metric tons (MtCO2e) by 2030, with conditional measures that could bring emissions down further to 369 MtCO2eq in 2030. Carbon-neutrality goals, which are designed to reach zero net emissions by a certain date, are also fixed-level targets. Six countries (Argentina, Armenia, Bhutan, Costa Rica, Ethiopia and Oman) submitted this type of target. Base year emissions targets are usually expressed as a percentage relative to a historical base year. This type of target can be easily calculated when countries also provide data on base-year emissions. For example, Japan committed in its NDC to reduce emissions 26 percent below 2013 levels by 2030, bringing the country from 1,408 MtCO2e in 2013 down to 1,042 MtCO2e by 2030. Baseline scenario targets are straightforward only if the country provides information on projected levels of emissions in the target year. For example, Mexico submitted a target to reduce GHG emissions 25-40 percent by 2030 compared to business as usual (BAU). The NDC includes projections for BAU emissions levels, making it easy to calculate the target level of GHG emissions by 2030—623 MtCO2e if conditions such as access to low-cost financial resources are met, and 759 MtCO2e if they’re not. 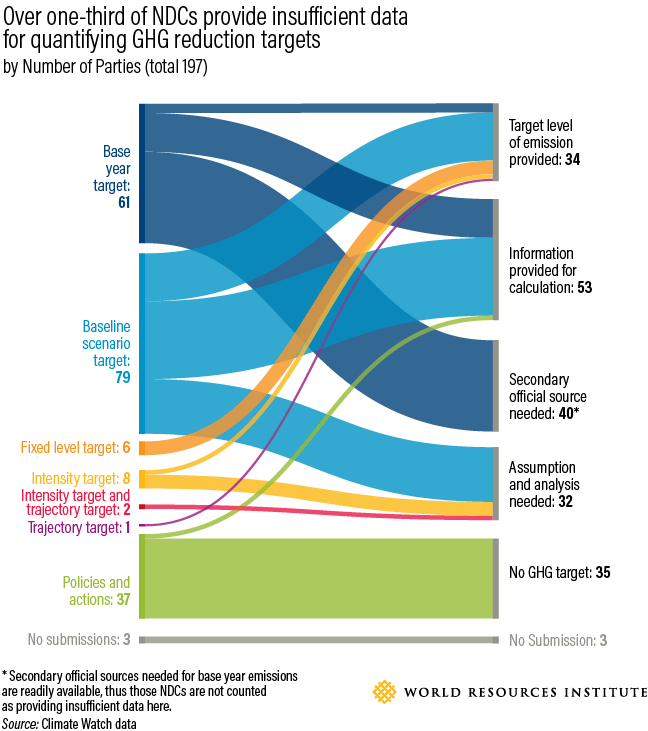 79 countries submitted baseline scenario targets, and 57 provided the baseline projections necessary to calculate absolute emissions in 2030. It’s important to note that even if enough information is supplied to calculate target year emissions, it will be difficult to have confidence in these figures if the baseline scenario target is dynamic, as the target year emissions will change as the baseline is recalculated. Intensity targets are not designed to limit emissions to any given level; instead, they focus on reducing the intensity of emissions per unit of a variable (for instance, GDP, population or energy use) compared to a historical base year. Further analysis and secondary data are then needed to understand intensity targets in terms of anticipated emissions corresponding with the intensity target. Ten countries submitted intensity targets as part of their NDCs. Currently, only 87 out of 194 NDCs provide sufficient data to understand target year emissions levels without requiring further assumptions. To calculate target year emissions, we filled in data gaps on base-year emissions for 40 countries using information from secondary official sources like national communications, biennial update reports or national inventory reports. Thirty-two countries do not provide enough information in their NDC to calculate what their plans really mean for 2030 emissions. In such cases, we made assumptions to quantify targets when feasible. China and India, for example, didn’t provide enough clarity on which sectors of their economy are covered in their emissions targets, and India didn’t specify which greenhouse gases are included. As their targets are intensity targets and no official data sources were available for GDP projections, we had to make assumptions and used a range based on several sources. This process introduces further uncertainty due to the range used. In another instance, we were unable to quantify Iran's emissions target, since no official source is available for their BAU emissions projections. We were unable to calculate targets for 35 NDCs that did not include a GHG target and did not provide estimates of future emissions based on the actions they plan to take. We took a simplistic approach with relatively straightforward calculations to quantify countries’ future level of emissions. 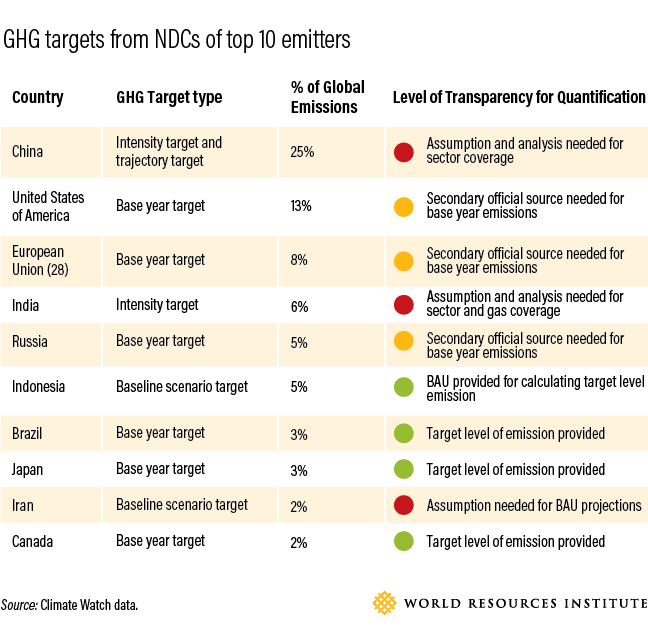 Initiatives like Climate Action Tracker and PBL Climate Pledge NDC tool have published estimates of future emissions for a select number of countries through modeling exercises that factor in non-GHG targets and policies and actions, in addition to GHG targets. The upcoming climate negotiations at COP24 in Katowice, Poland will be a crucial moment for promoting greater transparency. Negotiators are working to finalize a rulebook that will guide countries in meeting their commitments under the Paris Agreement. It should require transparent and robust information on NDCs, which countries should be encouraged to fill out when they revise and update their NDCs in 2020. Without greater transparency, the global community’s efforts to prevent catastrophic climate change will be on shaky ground. Climate Watch provides quantified emissions reduction targets for over 150 countries, as well as detailed information about every individual NDC. The data will be updated annually to track countries’ progress towards their GHG reduction goals.